While most scuba diving is done from land-based resorts, there are places where the only way to dive is from a liveaboard boat. One of these locations is the Bali to Komodo area of Indonesia. In 2012 Kelly and I went on a dive trip organised by our dive club, St George Scuba Club that visited this area. 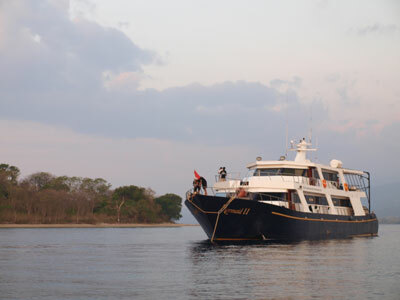 One of the operators is Mermaid Liveaboards (http://www.mermaid-liveaboards.com/about-us/). Our trip was on MV Mermaid II and it ended up so popular that we booked the whole boat. 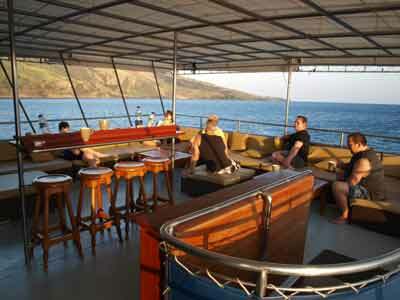 The trip was a seven night adventure that started at Bali and went to the Komodo Island area and back again. The Mermaid II is a 32 metre steel hulled ship built in 2000. It has three levels, two of which are the main decks and the lower level the crew area and home to the cheaper cabins. The ship normally takes a total of 18 passengers in 8 deluxe double cabins and one bunk type cabin. However, we had two of the bunk type cabins (I assume this is used by crew) meaning we had 20 members all up. It was not till the last day that I saw some of the staff. The kitchen hands did not seem to venture up much as far as I could see. There were about 15 crew as far as I could see. As well as the skipper and assistant skipper, there was a trip director, dive masters, boat drivers, chefs, videographer (rip off price for the video he made) and some more. As mentioned, there are eight deluxe double cabins and one or two bunk cabins. 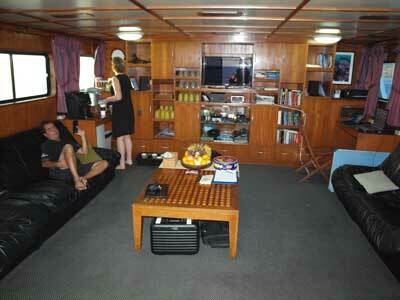 The deluxe cabins are on the main deck that also has the dining room and dive deck. Each cabin is roughly the same, with a double bed and a fold down single bed. Thus they can accommodate a couple or two singles. They also have a small bathroom. There is a small amount of storage space for clothes and bags will fit under the bed. The single bed is best left down (I assume it does fold up) as this is where we stored our cameras, dive computers, laptops etc. You will need to bring along a powerboard if you have more than a couple of things that need charging (we needed to charge after every dive batteries for two strobes, two video lights, the video and the camera. As well, each day we needed to charge dive torches and other items. The cabins are not huge, but the only time we spent in there was changing after a dive, preparing for the next dive and sleeping. The cheaper cabins are below this deck towards the bow. They were quite roomy but shared a common toilet/shower. If you can afford it, go for the more expensive cabin, but if they are all gone, then these are not too bad. The main living area is above the dive/accommodation deck. This has a very large semi-open area at the stern where we spent most of our time between dives. It has some comfortable cushions on the seats and it was a nice place to write up log books and download computers. It was also the place where we mostly had evening drinks. In front of this is the lounge area. This has a TV (for videos) and library as well as tea/coffee making facilities. There are quite a few lounges here as well. The dive briefings are carried out here (more about them below). To be honest, I did not spend much time in there, Kelly and I mostly stayed out on the "open" deck. Even at night, it was nice here, although at times we did need a jumper as it can get cool when the boat is moving. The food was outstanding. Mostly Asian, there were many different dishes for every meal. As well as an early morning simple breakfast, there was a cooked breakfast after the first dive of the day. The only complaint was that the dining room is very small, even with only 18 people on board it would be crowded. Apart from that, everyone raved about the food. As well as free tea and coffee all day in the lounge, there was free water and soft drinks. The soft drinks are in small fridges in the lounge and dining room. Bintang beer was also available at a reasonable price. This operates on a honour system. Diving is generally four dives a day. The first one is about 7:30 am in the water, the second about 11 am, the third around 3 pm and the last one about 7 pm. The vessel has a reasonable sized dive deck, but it can get a little crowded. Your gear lives in the same spot the whole trip. Once you set up your BCD and regs, all your gear, including your wetsuit, fins, mask, weight belt/pockets etc gets tagged with a number so that the crew knows where it belongs. Tanks are filled in situ. Diving is done 99% from two rigid inflatable boats (RIBs) that carry about 6 divers and the driver. More about this below. On the trip we did there were 20 dives offered. These were three dives on the first full day, then four dives, four dives, four dives, three dives and two dives on the last day. There were night dives on four evenings. The time of the first dive is notified each evening and then the times for the dives during the day are set in the morning, although there could be some variation according to dive times etc. Fifteen minutes before the dive time, you assemble in the main lounge for a comprehensive briefing. These are the best I have ever had, including detailed maps and photos of things to look for on the dive. Once you establish (via the first dive) your ability, the dive rules are quite relaxed. Basically we could dive for as long as we wanted to (apart from night dives which had a strict 60 minute limit for obvious reasons). We could also go to what depth we wanted to and did not need to follow the guide. However, for most dives, it was wise to follow your guide as they knew where to find all the great creatures you can see in this amazing part of the world. Anyway, once the briefing is complete, the first two groups head down to the dive deck. At the first dive you are allocated to a dive guide and boat (or you make them up yourself as we did). You dive with the same people the whole trip (well at least start the dive with them). For each dive, the order of the groups swaps around, so that if you go first on the early dive, you will go second for the next dive and so on. When you go to your spot your wetsuit will be hanging on your tank. Your fins etc are stored under your gear. After putting on our wetsuits and booties, we normally took our camera, fins, mask, gloves and placed them down on the lower dive deck where the boats are boarded from. We then put on our BCDs and climbed down the ladder to await the boat. You climb in the boat when it arrives, assisted by the crew. You sit down and then the crew will pass over your other gear and put your fins on for you. Generally it is a short run to the dive site from where the larger vessel is anchored (or waiting). You put on your mask and then everyone rolls off at the one time. You can either follow the guide or do your own thing. Again, it is important to let the guide know what you are doing. We generally stayed with the guide for 20 minutes or so and then did our own thing. For some dives we just dived by ourselves the whole time. Once you have decided to end your dive, you simply ascend and signal to one of the two RIBs and they will come and collect you. If everyone ascends at the same time you may need to wait a while to be collected. Mostly we stayed down at five metres till we saw a boat overhead. Once the RIB arrives, you pass up torches and cameras, remove your weight belt/pockets and pass them up as well. Then you remove your BCD and the driver pulls the whole thing aboard. Then you take off your fins and climb the small ladder back into the boat. Once back at the Mermaid II, you get out of the RIB with only your camera (and perhaps mask). All the rest of the gear will be removed by the crew, washed and returned to your spot. Cameras, computers and masks etc are put in the rinsing bin. You are helped off with your wetsuit which is then washed and hung up by the crew. There is a cold water shower at the stern (which is warm enough) and you use this to rinse off. You then find your numbered towel (freshly dried after the previous dive) and dry off before heading inside to change. Easy. 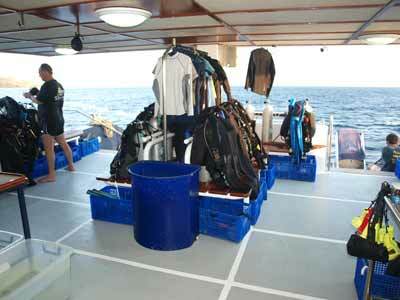 Apart from a couple of dives where we had raging currents, our bottom times for the trip averaged 65 minutes. Some of the current dives were short, but in at least two of the spots we got out and went back and did the same dive again using the remaining air. If you count these dives as one dive, we averaged almost 65 minutes for all the dives we did. I did 22 dives out of a possible 20 (doing two twice as explained above). Nitrox is available, I think from a membrane system. This can be purchased for the whole trip and is more economical that way. I think the cost was E95 (say AUS$130) for the trip. A bit pricy but worth it. On our trip we left Bali (the marina is at Benoa, do not confuse this with Benoa Beach). We stayed the night at Benoa Beach and it was a long trip from there to the marina. You would be better off staying at Kuta, Denpasar Selatan or Senur. There is a new bridge/causeway under construction that should make it a lot easier to get to the marina, especially from near the airport. You are picked up from your hotel and then taken to the marina. You board about 1 pm. A lunch will be provided (if it is not, ask for it). Due to the time you are collected, you will not get any food otherwise till dinner. Once aboard you complete more paperwork (not sure why the stuff you did when you booked is not good enough) and show your dive cards. You then set up your gear and put away your clothes etc. A boat and overall dive briefing is then given as the boat sails out about 3 to 4 pm. The first night is spent motoring to the east and you arrive at the first dive site about 10 am or so. The seas can get a bit rough, especially as you pass by the straits between some of the islands. However, it is not too bad from my experience. On the last day your last dive will be near where your first dive was. You finish this dive about 1 pm and then motor back to Bali. All your gear gets washed by the crew and is available for packing later. Back in the marina the next morning you have breakfast and then depart the boat. I would recommend another week at Tulumben after leaving the boat. See my pages on diving there. This was one of the best holidays Kelly and I have ever had. The service was outstanding, the diving spectacular and the food excellent. It was a well run vessel that permitted experienced divers (and we all were) to dive how deep and long they wanted to. I would strongly recommend them to you.